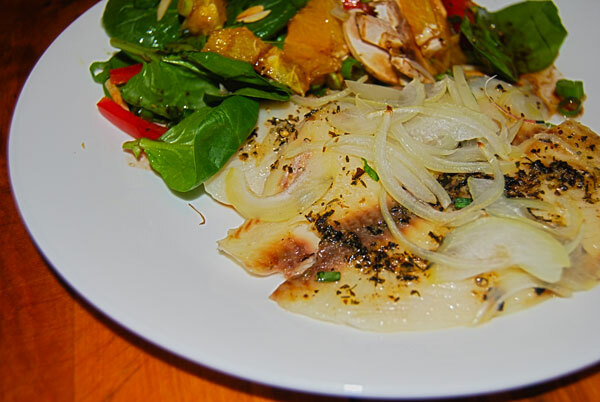 Ingredients: (Main Dish) Tilapia, olive oil, garlic powder, marjoram, thyme, pepper, bay leaves, onion, white wine. (Side dish) Spinach, orange, green onion, mushrooms, lemon juice, olive oil, pepper, toasted almonds. Embellishments/Substitutions: I didn’t have any marjoram so substituted basil on the fish. The fish recipe also didn’t call for any salt – I added about 1/4 tsp. I had half an avocado, and 1/4 of a red pepper which I added to the salad. I didn’t care for the Emeals recipe for the salad dressing (just oil, lemon juice and pepper), so added 1/2 packet of splenda, 1 Tbsp of Balsamic vinegar, and a bit more oil to thicken it up a little. Comments: The fish was quick and easy to prep and tasted delicious, and the salad came together quickly while the fish was in the oven. Very easy weeknight meal for you working parents out there…. Thumbs up! Looks delicious! Will roam around on your blog in search for inspiration (which I’m in dire need of!)! Thanks so much Sara !